Here you are going to help Gumbal and Darwin to escape and avoid all the obstacles. Be sure that you can do this, just be attentive and use arrow keys and space to collect all the stars and reach the door. Are you ready? Then move forward! Do you wanna to help them right now? Then just do it right no! 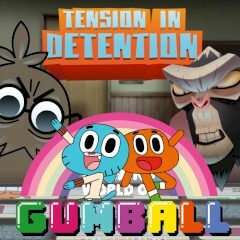 You will have to help Gumball and Darwin escape from detention, after being accused of a prank they did not commit. So, just jump, run, and figure out puzzles to escape from school. But be really careful and beware of school surveillance screens. So, can you complete the levels and help Gumball and Darwin be free? Well, then just do not waste your time and start the game immediately! Are you ready for such a challenging game? Then have fun!